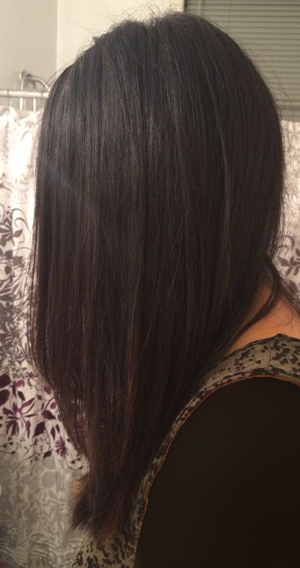 At-home keratin treatment — does it work? There’s a reason keratin treatments are so popular. Women shell out hundreds of dollars every few months to soften the frizz and tame the kinks and cut their drying time in half (to read more about what keratin treatments do exactly for your hair, check out my post here and here). I’ve read about at-home keratin treatments and was wondering if they compare. Rio de Keratin was one of them. 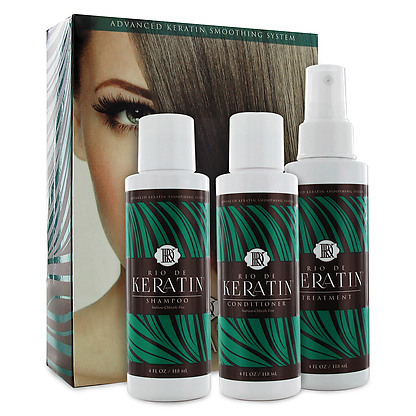 The brand is DIY 100% formaldeyde-free (a carcinogen-emitting ingredient found in many salon treatments of the same kind) at-home keratin treatment, and its key ingredients include keratin, vitamin E, and jojoba and coconut oils. I met the founder, Nadine Ramos, at an event for the products recently and she has the most stunningly glossy head of hair, so I decided I needed to know if this worked. I feel my hair is still pretty smooth from the last keratin treatment I did, so I enlisted the help of a friend to test it out instead. My friend Q has wavy, sometimes-frizzy, and dry hair mostly from heat damage (self-described…I like to say she’s an off-duty model). The instructions were less intimidating than I thought. It says to first shampoo your hair (no conditioner!) with the shampoo in the kit and do a rough blow dry until hair is completely dry. Next, section off hair, spritz the keratin spray on the first section and flat iron. Do this section by section until you finish all of your hair. Lastly, don’t wash for another 24 hours. Afterwards, continue using the kit’s shampoo and conditioner for best results. The kit comes with the aforementioned shampoo, conditioner, spray on treatment (which has a nice coconut scent), and a pair of gloves to use when treating hair. I wish it came with clips too because I was scrambling looking for one when I was doing Q’s hair. I followed the instructions, spraying each section of Q’s hair with a very light hand because her hair isn’t super curly and I didn’t want it to fall flat — my greatest fear — before the wedding she had to go to a couple days after that. The results? For starters, her hair was definitely a lot more, noticeably shiny (other people who didn’t even know she did the treatment commented on it too). She said she could notice the difference in the first few days as well. After a week, I asked her again if she feels a difference in the frizz, and she said slightly (her hair wasn’t that frizzy to begin with so there’s that caveat). She mentioned her hair still felt a little dry as it had felt before from heat damage, although she also hadn’t continued using the enclosed shampoo and conditioner as well so that could have been contributing to that. Also, as I mentioned I was light handed with the spray which could be another factor. Is it worth it? For $39.99 which they say spans about two treatments (maybe more if you have thinner hair), I think it’s definitely worth trying if you’re trying to save on cash and get similar results at home, or even as a stepping stone to salon keratin treatments. I was amazed at the shine, but it does require some maintenance to keep it up. It is supposed to be a DIY kit, but I think it’s a lot easier to enlist the help of someone else when using the spray on treatment, especially for the back of the head. Who is it meant for? I’d probably recommend it for people hair that is often frizzy or hard to manage, and also to ease the curl if your hair is unruly. Or if you live in more humid conditions where your hair poofs up (you know what I’m talking about). If you have straight-to-wavy hair you probably don’t need it, and especially if you feel like your hair already falls flat. Anyway, those are just my thoughts. 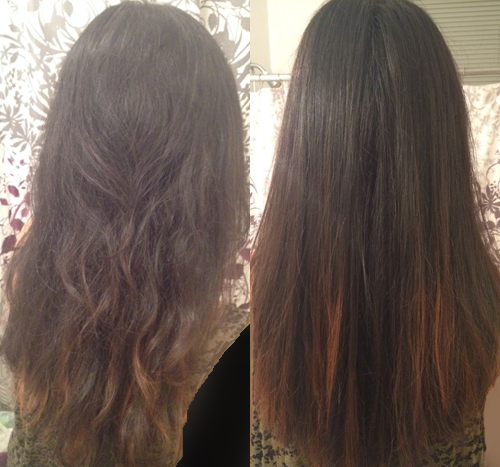 Anyone else try a DIY keratin treatment? What did you think? The Rio de Keratin Smoothing System includes our mess free, easy to apply Rio de Keratin treatment that will lock in moisture, eliminate frizz, and leave hair silky smooth.